After two days of reflection and conversations with the Patriots, New England offensive coordinator Josh McDaniels has decided not to accept the Indianapolis Colts' head-coaching job, the team confirmed Tuesday night. 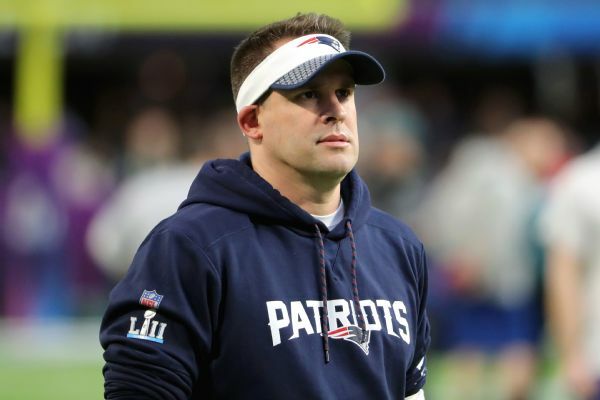 "After agreeing to contract terms to become the Indianapolis Colts' new head coach, New England Patriots assistant coach Josh McDaniels this evening informed us that he would not be joining our team," the team said in a statement. "Although we are surprised and disappointed, we will resume our head-coaching search immediately and find the right fit to lead our team and organization on and off the field." In the past 48 hours, Patriots owner Robert Kraft began talking with McDaniels and ultimately wound up sweetening his contract, helping to entice McDaniels, who had yet to sign a contract with the Colts, to remain in New England, a source said. But this wasn't a decision about money, sources said. McDaniels, 41, had been vacillating on this decision throughout the interview process, ever since meeting with the Colts on wild-card weekend. It is the reason a second meeting with Colts officials and team owner Jim Irsay was held. McDaniels was trying to get comfortable with the idea of taking his family out of New England and moving to Indianapolis, sources said. Throughout the process, McDaniels had emphasized to the Colts that he would need time to mull the decision and discuss it with his family. The more McDaniels reflected on potentially having the opportunity to coach the Colts, the more it did not feel right to him and the better it felt to remain in New England. McDaniels still would like to become a head coach again, but in this situation, he was not comfortable. The Krafts also stepped in this week to make McDaniels feel even more wanted, and the two sides were able to come to an agreement Tuesday night that will enable New England to retain its offensive coordinator during an offseason in which it is already losing defensive coordinator Matt Patricia, who will become the Lions' new head coach. The about-face from McDaniels caught the Colts off guard. In a text to ESPN's Mike Wells, one member of Indianapolis' front office described the situation as "Unreal. I'm at a loss." Josh McDaniels has had plenty of success in New England, but things haven't gone quite as well with other teams. McDaniels' decision to stay could spark speculation that perhaps Patriots head coach Bill Belichick's tenure is about to end, but those close to McDaniels say that isn't the case, a source told ESPN's Mike Reiss. The bigger factor for McDaniels was that the Patriots, who hadn't addressed his future until the past week or so, made an ultra-aggressive late push to try to entice him to stay. Had that happened a month or so ago, even if there was clarity that Belichick was definitely going to be the coach in 2018 (which he decisively is), McDaniels might not have pursued other head-coaching jobs as aggressively as he did. Indianapolis now finds itself in a coaching bind, playing catch-up at a time when the other head-coaching openings in the league have been filled. During the interview process, the Colts spoke with McDaniels; former Kansas City Chiefs offensive coordinator Matt Nagy, who accepted the Chicago Bears' head-coaching job; former Houston Texans defensive coordinator Mike Vrabel, who accepted the Tennessee Titans' head-coaching job; former Carolina Panthers defensive coordinator Steve Wilks, who accepted the Arizona Cardinals' head-coaching job; Baylor head coach Matt Rhule, who said he will remain with the school; and former Seattle Seahawks defensive coordinator Kris Richard, who took a defensive passing-game coordinator coaching job with the Dallas Cowboys. Despite McDaniels' sudden shift, two people who agreed to be assistants for him in Indianapolis will remain with the Colts, regardless of who the next head coach will be, sources said. Former Cowboys assistant head coach/linebackers coach Matt Eberflus signed to become the Colts' defensive coordinator, and former Illinois defensive line coach Mike Phair signed to become Indy's D-line coach. Indianapolis now has coaching and quarterback questions. On Sunday, ESPN's Chris Mortensen reported there still are concerns about Andrew Luck's shoulder and whether he could wind up needing additional surgery. The Colts now will have to go back to the drawing board, while the Patriots have some of the coaching stability they appeared to be losing. The situation is not entirely dissimilar to when Belichick stepped away from the New York Jets' head-coaching job after the 1999 season, but he did that the day of his introductory news conference. McDaniels did it the night before he was scheduled to be introduced by the Colts. Information from ESPN's Mike Reiss contributed to this report.